The Boat Garden Update. Sunday 15th April. In my seemingly constant quest to make my life more difficult, some of you will be aware that I am attempting to create a cutting garden on my narrowboat, Casper. The first four months of the year see me knee deep in seed orders and sending parcels out to all the classy flower growers in the UK and the Continent. This is the first year I have accomplished this on a 45ft boat with a one-year-old hunting hound as my only source of assistance. We have survived The Beast From The East…we have come away unscathed from the surly postmistresses of the Oxfordshire villages…even having to swim across the freezing canal to rescue Casper and Flash who had decided to drift off to the other bank did not dampen our ardour for this life afloat. The winter has had its challenges but now the sun is wiggling her hips, most of my customers have received their seeds…and it is time for me to pick up the pace with regards my own flowery projects. *The garden will be planted up into 20 of so builder’s buckets. Higgledy is moving toward being as plastic free as we can. (We have never sent any parcels which weren’t 100% compostable) But I am continuing to use plastic products that we already have. Buckets are not so light that they will get blown over and not so heavy that they will be difficult to move. 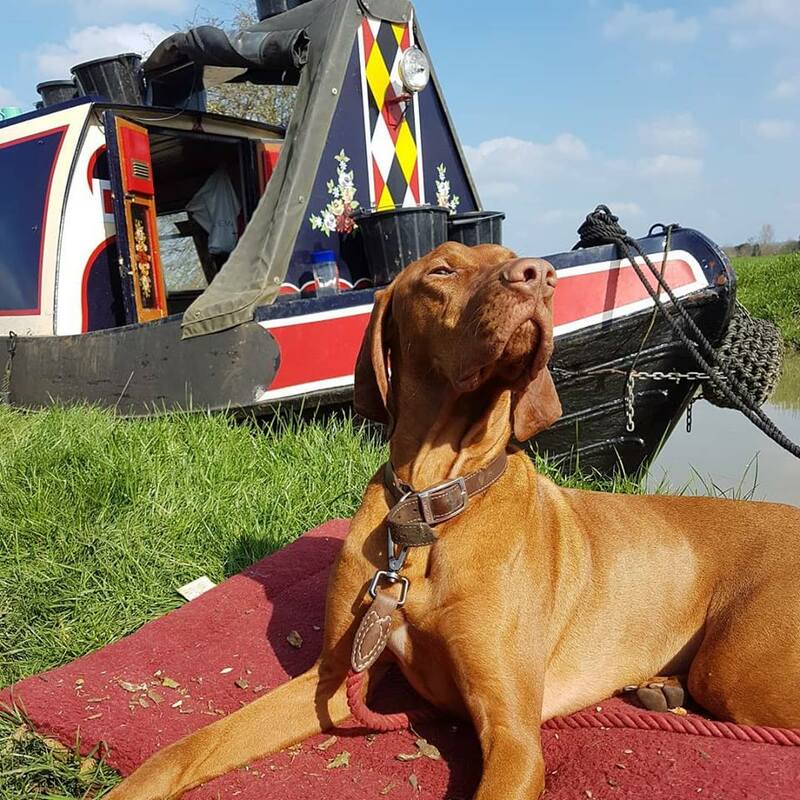 When we are travelling the buckets will be moved to the foredeck and into the cabin where Flash will keep an eye on them….or not. 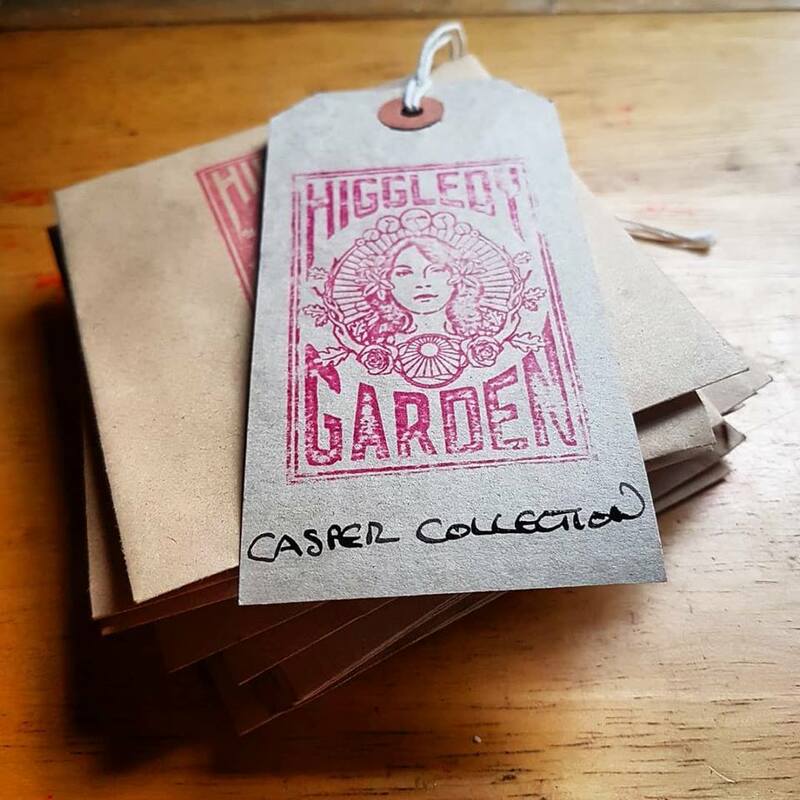 *I have sown all ten varieties in my ‘Casper Collection‘. 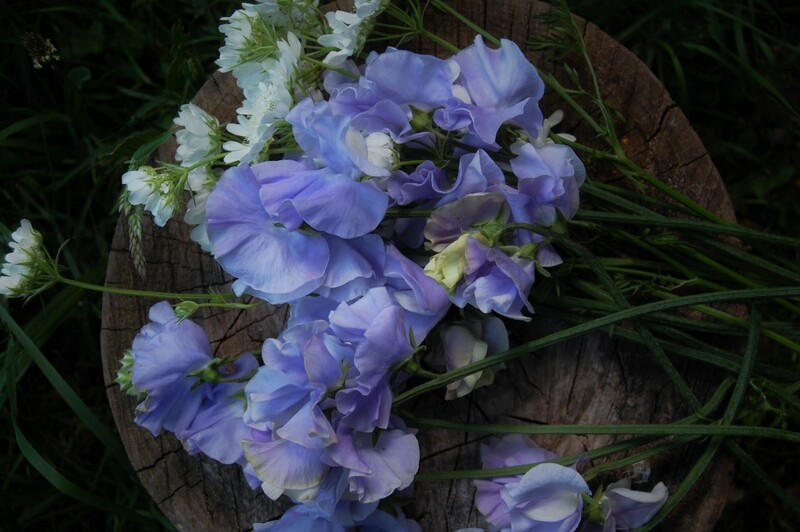 I have sown all my varieties of Sweet Peas. 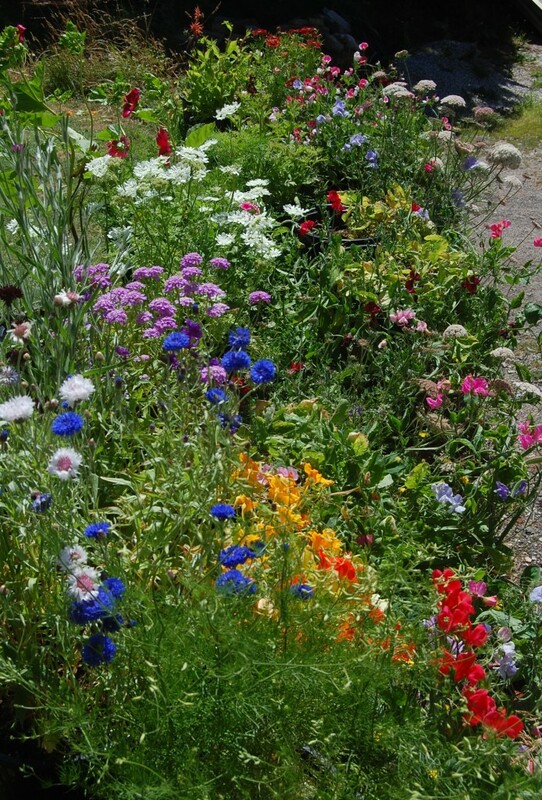 Today I shall be sowing more annuals…frankly I find sowing seeds in the spring sunshine somewhat addictive. Annuals are my thing. *The plan is not to have all the buckets on the roof in the style of a roof garden but instead have the sweet peas trailing down the side of the boat from the roof….and the other annuals growing up from buckets placed against the boat on the towpath (as long as they are not a hazard to other towpath users of course) My gleaming vision is that the side of Casper will be totally covered in flower plants and the passing towpath maidens will swoon themselves into my composty arms. 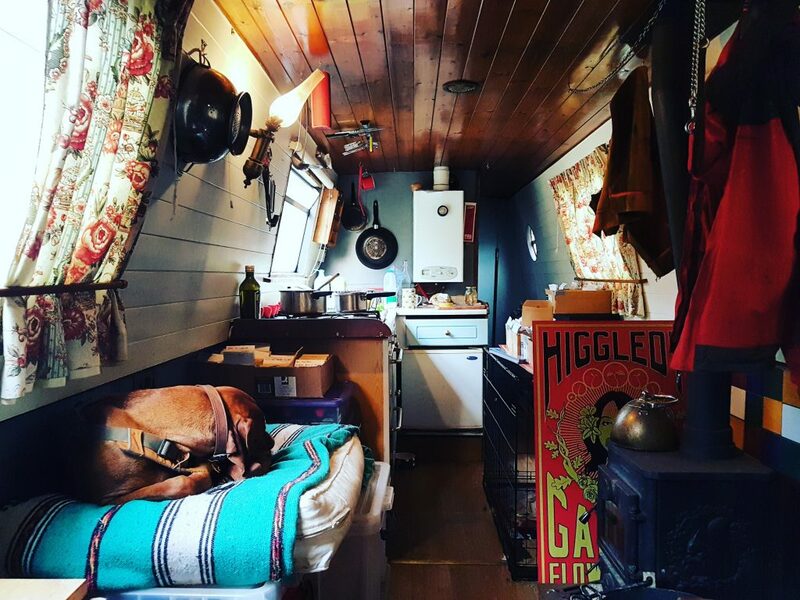 Our floating home and workplace. My buckets garden a few years back, when I was based in Cornwall. My method has been to sow seeds into three-inch pots and keep them cosy in storage boxes in the cabin while they find their seedy feet…then as soon as they have germinated, the box gets moved onto the roof. I sowed up one box of annuals on the April 5th…another box yesterday (14th) and I will sow a final one today. This will give me far more seedlings than I can use but I’m sure it won’t be a problem to rehome them. In total, I hope to have somewhere in the region of sixty plants…not loads…but enough to keep a Benjamin shaped thing happy for the summer. I will be keeping a record of developments and will post a blog every Sunday morning. It is not too late to sow your seeds….you can sow right through into late May. All my seeds are of course available in the Higgledy Seed Shop. Benjamin Higgledy & The Fantastic Mr Flash. PS Please share with your chums if you think it would be interesting to them by clickifying on a button below. Thank you.